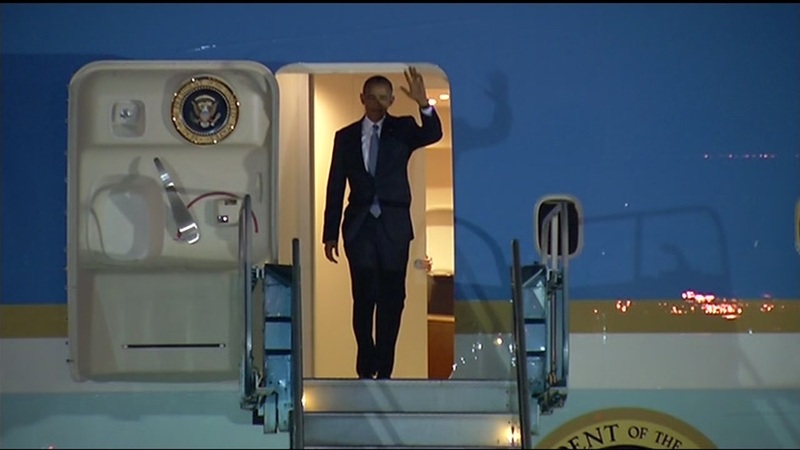 SAN FRANCISCO (KGO) -- President Obama arrived at SFO on Friday night for a new fundraising swing through the Bay Area - this one has some Hollywood star power. He was greeted by Governor Jerry Brown and San Francisco Mayor Ed Lee. The president's motorcade arrived at an exclusive fundraiser in the South of Market District. His host was DropBox co-founder Drew Houston. It was a closed event with only 20 people in attendance, who paid nearly $34,000 each to be there. It comes as the president continues to talk about gun control. He's now at the Fairmont Hotel in San Francisco's Nob Hill. The roadblocks and barricades are up with a big police presence around the building. "Just kind of serendipitously found out the president is going to be here so we're spending the evening hoping to get a glimpse of him," one onlooker said. "I'd love to see him if I can because I'm actually a federal worker. He's actually my boss," tourist Margo Warren said, laughing. A lot of people got stuck in traffic because of the barricades. On Saturday, Obama will speak at San Francisco's Warfield Theater at a fundraising concert featuring rapper Kanye West. Tickets start anywhere from $200 to $10,00, which will get you a picture with the president. The fundraiser will support the Democratic Hope Fund, a joint fundraising committee authorized by Obama for America and the Democratic National Committee. This wraps up a West Coast trip that started in Oregon. Marine One touched down in Roseburg Friday afternoon. Obama was there to meet privately with the families of the nine people killed last week in a mass shooting at Umpqua Community College. "Obviously in moments like these, words aren't going to bring their loved ones back," he said. Plenty of protesters showed their opposition to the president's call to tighten gun controls. They accused him of politicizing this tragedy but he didn't shy away from calling for changes. "There are going to be moments as we go forward where we're going to have to come together and figure out how to stop these things from happening," Obama said. After his visit to Roseburg, he continued up to Seattle for a fundraiser before flying to San Francisco. Following Saturday's fundraiser, the president will fly on to Los Angeles for a series of fundraisers there.